There are days when you just want to relax and enjoy simple pleasures. Routine is reassuring. Casual makes sense. My routine on a Sunday morning is to head to yoga. Shri Yoga in particular. Lately my yoga practice is getting interference from my blogging practice. My meditation is rife with recipe musings. Perhaps just having a smoothie before class makes me long for real food? It doesn’t help me stay focused knowing that the Metro store is just below the yoga studio…instead of “om”, I’m internally chanting my grocery list. After picking up the “right” eggs, as per Harriet Sugar Miller, some whole wheat wraps and a few odds and ends my plan was formed. It took a few minutes to throw this comfort food wrap together and it stayed piping hot until the very last bite. 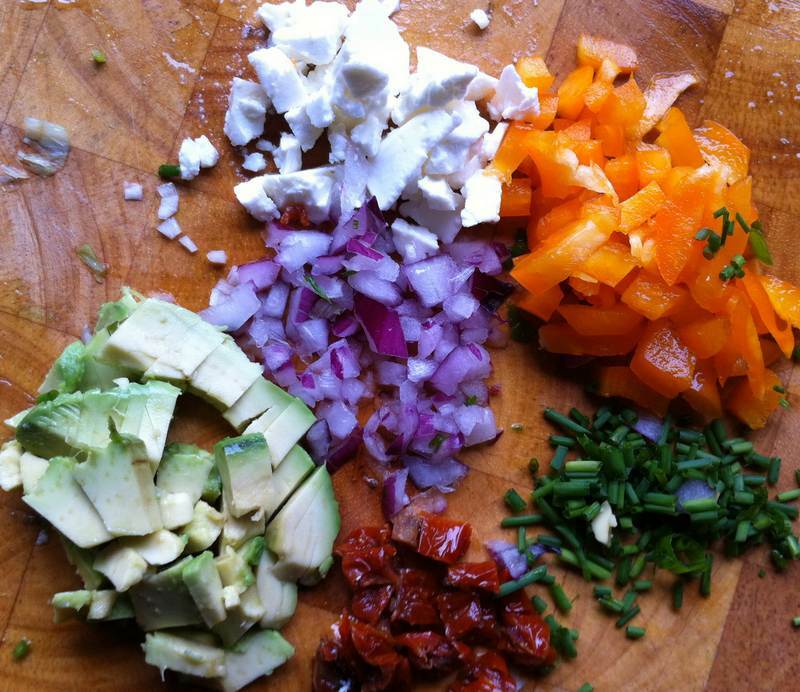 Mix the eggs with the Dijon, salt & pepper then add crumbled feta and sun-dried tomato. Heat butter in a medium-sized pan, then sauté onion and pepper until softened. Add egg mixture to the pan, flipping when set. 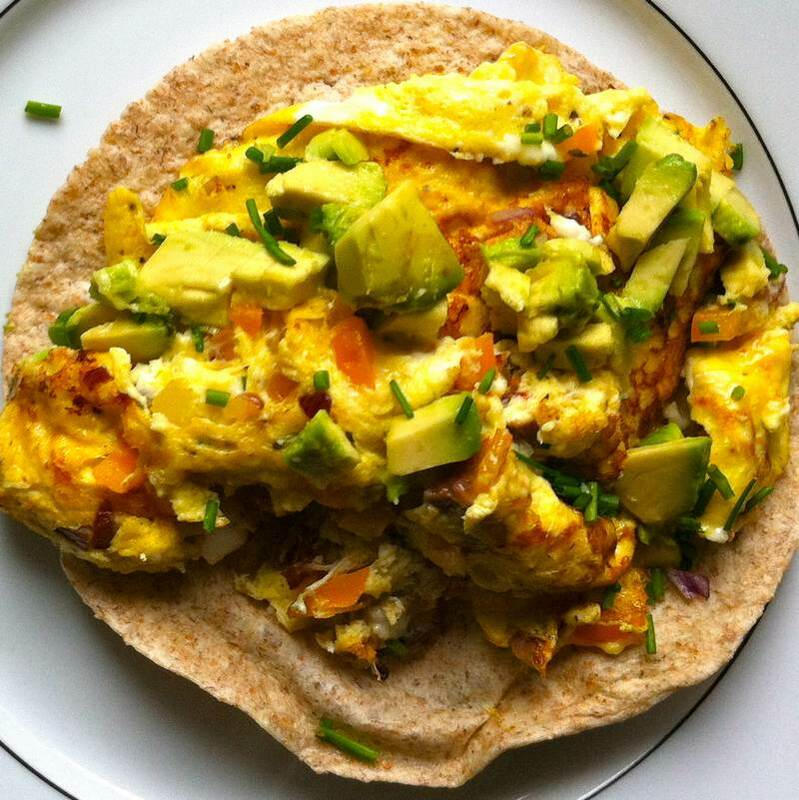 Place the cooked quasi-omelet on the warmed tortilla, adding the avocado and chives. Fold and eat. If you are concerned about getting the tortilla to just the right amount of heated and not into the browning crispy state that will crack rather than fold, just put a bit of crumbled cheese onto the tortilla and remove it from the pan when the cheese melts. Dear Jittery Cook, no egg on your face! Usually the only wraps that inspire me are cashmere, but I’m intrigued by your soft-eggy wrap recipe. Haha! You won’t be disappointed with the inside warmth that these eggy wraps provide and the accolades will compete honorably with those garnered by lovely cashmere wraps. Stay tuned for some more great recipes. They are stacking up.